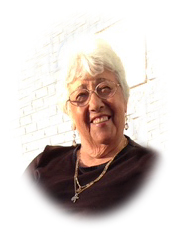 Maria Ada Cascini (Iachetta) of Thunder Bay, Ontario passed away peacefully at her home on Monday, February 4th, 2019. Born in Grimaldi, Italy on April 2nd, 1931 she immigrated to Canada where she met and married her beloved Rocco. Loyally, they worked side by side for almost 50 years. She cherished time with her family and friends, enjoyed cooking and gardening. Her welcoming smile always greeted those she shared time with. Predeceased by loved family and especially her soulmate Rocco. Survived and missed by Daniel, Paul, Nancy and family both here and abroad. Funeral services will be held on Friday, February 8th, 2019, when family and friends will gather for Funeral Mass at 10:00 am, at St. Dominic's Church celebrated by Rev. Michael Mahoney. Private family interment will follow in Mountain View Cemetery. Visitation will take place on Thursday, February 7th, 2019 from 7:00-9:00 pm in the Blake Funeral Chapel. In lieu of flowers, donations can be made to the Heart and Stroke Foundation. Maria Ada Cascini will be remembered in the Blake Funeral Chapel Memorial Grove. Annual dedication service Sunday, June 14, 2020.